Lkmediabook - Savanna River Republic 24 - 26 November, Breede River. Savanna River Republic 24 - 26 November, Breede River, Swellendam. 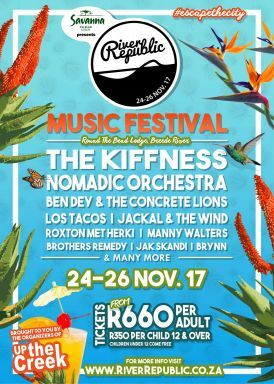 24 – 26 November 2017 at Round the Bend Lodge, Breede River, Swellendam. Renowned for the organising of Up The Creek, one of the Western Cape`s most loved music festivals, the Red Hot Events team also introduced a wild and wonderful new boutique-festival two years ago: Savanna presents River Republic. Set at the same river, on the plush lawns next to a beautiful creek, this new little festival embodies that pina-colada-hidden-paradise-kind-of-awesome-party that we all dream of. Take a break and escape to the River Republic for the coolest getaway party with your best friends and most loved local DJ`s and bands. 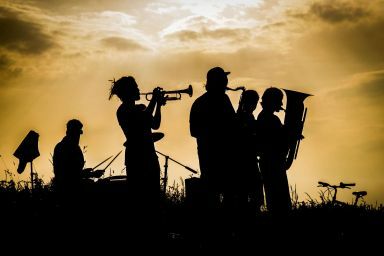 The line-up for this year is such a delight, we think for the love of grand sunsets, we`ve got it just right! The Kiffness, Nomadic Orchestra, Ben Dey & the Concrete Lions, Sean Koch Trio, BRYNN, Brothers Remedy, Bam Bam Brown, Dave Knowles, Hans Zen, Jackal & The Wind, Jak Skandi, Koisan, Los Tacos, Lt. Fizzer, Manny Walters, Mobbing Bali, MT Seas, Roxton met Herki, Astra Funk & The Space Cats, Money for Bali & Well Done Sun. To keep the good times rolling, we are also bringing you some live comedy over the weekend:Anne Hirschis your MC on Saturday and comedianKagiso Mokagadiwill be providing us with good laughs. On arrival you will be greeted with afree ice coldSavannaas you jump on the shuttle down to the festival. Just the thing to get your weekend started and well deserved after your drive! Mexican madness hour: When a band likeLos Tacoscomes along you just want to get your groove on. With a mix of Latina and Capetonian blood, their catchy Latin American tunes will shake up the river banks. Don your sombreros, sip on tequila flavoured Savanna Locos and hula, hula people, let`s party! *Both options include a cold Savanna on arrival! All tickets include a camping spot.